It’s interesting to note that GSK were named as one of RepRisk’s most controversial companies in 2013. That’s 5 years after CEO Andrew Witty took the helm and promised that all of GSK’s bad behavior was from ‘another era’. This fabled era which Witty keeps harping on about perhaps relates to GSK’s illegal an unethical behavior under Witty’s predecessor JP Garnier. However, Andrew Witty was a high ranking corporate executive during JP’s reign and has been with GSK since 1985, therefore it’s kind of puzzling that he would try to allude that GSK’s unethical behavior has nothing at all to do with him or his leadership, surely as an employee of some 40 years, Witty would have some knowledge of what GSK get up to? Furthermore, even after GSK settled a 3 Billion dollar fine (from the brave and courageous whistle-blowing claims of previous GSK employee Greg Thorpe) in 2012- which apparently were to put an end to GSK’s corruption and bribery era- they were still named as one of the most controversial companies of 2013. They attained this accolade from their various ethical and moral transgressions such as a half a billion dollar fine (and sentencing of GSK staff from) their vast bribery network uncovered in China and US office of fair trading accusations in relation to Seroxat and Wellbutrin violations etc, in 2013. Indian activists have accused GlaxoSmithKline and MSD Pharmaceuticals of conducting illegal tests of their HPV vaccines on tribal girls in Andhra Pradesh and Gujarat. The Supreme Court said on Monday that the local activists filed a public interest litigation (PIL) alleging that the companies tested two unproven HPV vaccines designed to prevent cervical cancer – gardasil and cervarix – on 24,000 girls, including 44 patients at the Maharaja Yeshwantrao Hospital. Of these 44 patients tested, 10 were male, said the report. The Times of India reports that the PIL, filed by Kalpana Mehta of Indore, Nalini Bhanot and V Rukmini Rao representing Gramya Resource Centre for Women, alleges that the testing led to adverse effects on the girls’ health. Seven girls allegedly died during the vaccine trial. Justice S Radhakrishnan and Justice Dipak Misra have directed the Union government to immediately file its reply on the issue. The Christian Medical College, Vellore, has also been asked by the apex court to examine the medical records of the girls in question. About 72,000 Indian women die each year of cervical cancer, a disease caused by the human papillomavirus. Many of these deaths are preventable by vaccines already widely used in the US, Australia and Europe, and included in their recommended immunisation protocols. In 2009, Path, a US-based health charity, launched a project funded by the Bill and Melinda Gates Foundation to study the cost and feasibility of incorporating HPV vaccines, produced by Merck and GlaxoSmithKline, into India’s public sector immunisation programme. However, the programme to vaccinate 14,000 adolescent girls from poor families ran into trouble after seven died soon after their vaccinations. The ensuing media and political storm – highlighting sensitivities around drug trials in the developing world – has contributed to the restrictions on such studies, affecting both Indian and global pharmaceutical companies. The causes of the girls’ deaths were never established or conclusively linked to the HPV vaccine. But serious questions were raised over whether the participants’ parents – many of whom were illiterate – had given informed consent, and whether the project adequately tracked any adverse reactions. In August, an Indian parliamentary committee set up to probe the issue concluded the Path project was a clinical trial in all but name and that the organisation had used “subterfuge” to avoid the “arduous and strictly regulated process” of such a trial. The committee report said many of the girls’ consent forms had apparently been signed by school principals and hostel wardens, and expressed scepticism that the girls’ parents were fully briefed on the pros and cons. The committee also found there was no rigorous process to track adverse events, leading to “gross underreporting”. It came down hard on Indian government agencies for alleged dereliction of duty. “The safety and rights of the children in this vaccination project were highly compromised and violated,” the report said. It also claimed that Path’s “sole aim was to promote the commercial interests of HPV vaccine manufacturers, who would have reaped windfall profits had Path been successful in getting the HPV vaccine included” in India’s immunisation protocols. Path called the parliamentary report an “inaccurate characterisation of this important work” and said it disagreed with its “findings, conclusions and tone”. The organisation said the HPV project was driven by its belief that “poor and low-income girls in India should not be deprived of the right or access to this proven, life-saving and safe vaccine that wealthy and middle-class girls in India and around the world have access to through the private market and other public immunisation programmes”. The Indian Supreme Court has sought answers from the government in a case involving tribal children, who were allegedly inducted into a drug trial without their consent years ago, and died because of the consequent reactions. The court criticised inaction on the government’s part and gave it a month’s time to respond. Some children out of a group of selected children died after being injected with Merck’s Gardasil vaccine. The vaccine is manufactured by GlaxoSmithKline. According to some campaigners, a study, promoted by Bill and Melinda Gates Foundation, failed to obtain consent from children or their parents before they were administered with the drug. The allegations, if proved, would mean that the drug companies conducted an illegal drug trial on the children. The petitioners also asked judges to look into the way trials were conducted with Merck’s new cervical cancer vaccine, Gardasil 9. Research by MailOnline, revealed that some children showed abnormal symptoms after they were administered the drug. Gardasil 9, is expected to generate £1.2 billion a year in sales. The Indian Council of Medical Research (ICMR) had in 2010, asked state governments to suspend the cervical cancer control vaccination programme for girls after four deaths and complications among 120 girls were reported. The girls complained of stomach disorders, epilepsy, headaches and early menarche. An investigation by an Indian parliamentary committee had previously concluded that the trials amounted to a serious breach of trust and medical ethics. Merck and GSK have both been ordered to respond to the allegations made by campaigners. After taking into consideration the arguments from campaigners, the judges also ordered the government to produce an opinion on the issue of liability and compensation, which was welcomed by lawyers. The court expressed its unhappiness that the government had not come out with concrete action following the parliamentary committee’s findings. It gave the government a month to explain what action had been taken to investigate and what efforts had been made to obtain the consent of those taking part in the trials. Gardasil is a drug that is used to prevent cervical cancer, which is the second most common type of cancer in women and kills more than 265,000 people every year according to Cancer Research UK. 2,500 flowers are placed in front of Pfizer’s HQ, representing number of children who die of pneumonia each day. New York – Despite there being a vaccine that can prevent it, pneumonia remains the leading global cause of childhood death in many developing countries, killing almost one million kids per year. On the eve of Pfizer’s annual shareholder meeting, Médecins Sans Frontières (MSF) delivered to Pfizer headquarters the names of nearly 400,000 people who signed a petition demanding that pharmaceutical companies Pfizer and GlaxoSmithKline (GSK) reduce the price of the pneumonia vaccine to US$5 per child in all developing countries and for humanitarian organisations. MSF delivered the petition during a stunt outside Pfizer’s global headquarters in New York, where dozens of people placed flowers at the company’s door. One flower was laid for every child lost to pneumonia each day, resulting in 2,500 flowers – representing the number of kids who would die from pneumonia that day – piled in front of Pfizer’s front door. Reams of paper with the names of nearly 400,000 people from 170 countries who signed MSF’s ‘A FAIR SHOT’ petition lay in an empty baby crib. The petition urges the two companies making the pneumonia vaccine to drop the price to $5 per child (for all three doses). With Pfizer having earned more than $6 billion in sales for this vaccine just last year alone, signatories of the petition sent a strong signal to Pfizer’s CEO, board and shareholders that the company should not put billions of dollars in profits over children’s lives. Last year, 193 governments at the World Health Assembly unanimously passed a landmark resolution demanding more affordable vaccines and increased transparency around vaccine prices. The governments of more than 50 countries underlined the rising inequities among them caused by the increased financial burden of new vaccines, with many stating that the high price of new vaccines, such as the pneumonia vaccine, either prohibited them from introducing it or threatened their ability to maintain it in their routine immunisation programmes. Countries such as Algeria, Bosnia, Egypt, Indonesia, Jordan, Thailand, and Tunisia, among others, have expressed that they are not able to introduce the pneumonia vaccine because of its high price. Montage of photos of A Fair Shot campaign supporters in (clockwise from left) New York, Central African Republic, Jordan, Australia. MSF has vaccinated children caught in emergencies with the pneumonia vaccine in the Central African Republic, Ethiopia, South Sudan, Uganda and other countries. 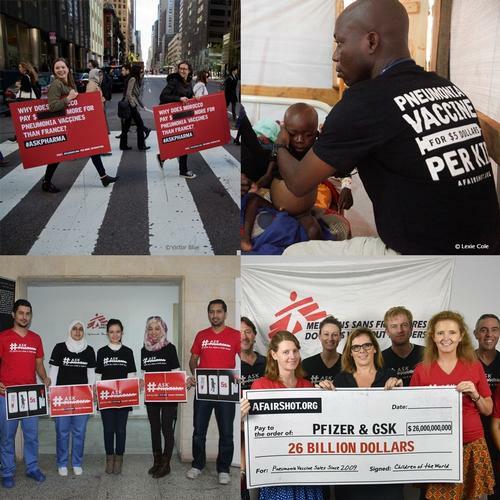 After more than five years of struggling to get Pfizer and GSK to sell the vaccine to MSF at an affordable price, MSF last year launched its ‘A FAIR SHOT’ campaign to push the companies to reduce the price of the pneumonia vaccine to $5 per child (for all three doses). In 2015, MSF released its vaccine pricing report, The Right Shot: Bringing Down Barriers to Affordable and Adapted Vaccines, which showed that in the poorest countries it is now 68 times more expensive to vaccinate a child than in 2001, with many parts of the world unable to afford new high-priced vaccines like that against pneumonia. “….But this is a recognition there is a lot you’ve done to present these things differently. But it is a recognition that it was pretty dysfunctional before, isn’t it? Because publishing data, to me, honestly, doesn’t seem like a great achievement. It just seems to me that that’s what you should be doing with data. It’s perfectly legal to pay. If you went to a physician and said, would you expect to be paid for speaking on behalf of somebody, they will probably say yes. Actually, in most countries in the world, it’s perfectly legal. However, there are risks it can be abused. People can make mistakes. And there are risks that there is a misperception. Just to your point on publication, do you think academics are mandated to publish their data? Do you think universities publish all their failed studies? There’s a lot of issues raised in just that short clip that are worth discussing but I’d like to focus on what the interviewer (Evan Davis) calls ‘Fuzzy Boundaries’ in the (so called) ‘perfectly legal’ (Andrew Witty’s words) bribing of doctors by GSK. Just because it’s ‘perfectly legal’ to pay doctors to speak on behalf of drug companies does not mean it’s ethical. People aren’t stupid, the public instinctively feel that doctors who are paid consultants to drug companies are bound to be biased and easily influenced, and they would be right in thinking that. The 2012 Department of Justice complaint (of which your company paid a 3 billion fine for) is riddled with examples of doctors literally prostituting themselves, and their reputations, to GSK. If these are the ‘perfectly legal’ scenarios which you think are ok then you really are out of touch with the public sentiment. If your ‘perfectly legal’ bribing of doctors was reasonable and acceptable, then we wouldn’t need things like psychiatrist Peter Gordon’s sunshine act for Scotland. Peter has been taking Seroxat for over 17 years and he cannot come off it. He also works within the mental health system as a psychiatrist and he is trying to change things. Maybe you should team up with people like Peter and ask for his input? That is, of course, if you really are serious about transparency?.. Over two years ago I raised a petition with the Scottish Parliament to urge the Scottish Government to introduce a Sunshine Act for Scotland. and all the written submissions made on behalf of this petition. The majority of participants felt that the publication of financial payments to healthcare professionals should be made mandatory. There is substantial evidence from other countries that the only effective way to make transparency mandatory is to have statutory legislation. A CONSULTATION about whether doctors should be forced to declare payments they have received from drug companies is biased, according to the medic whose action led to the move. 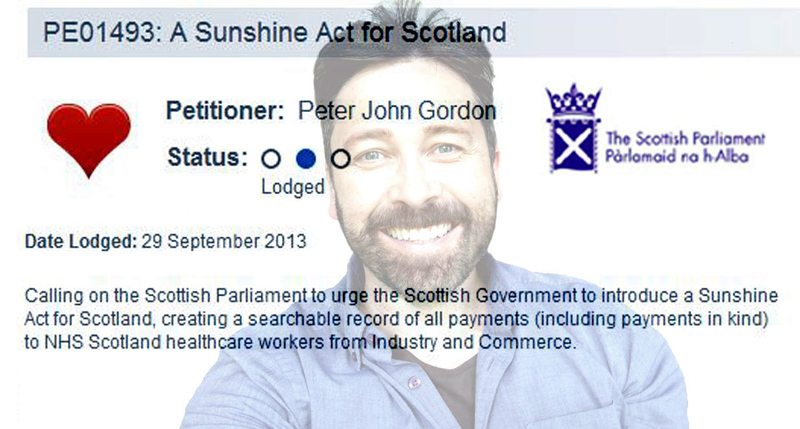 Dr Peter Gordon, a former consultant psychiatrist at NHS Forth Valley, has petitioned the Scottish Parliament to introduce a Sunshine Act, which would demand healthcare workers be open about their financial interests related to the medical industry and pharmaceutical companies. However, he says the Scottish Government’s consultation has presented “unbalanced” information which will not give the public the full picture about the status quo. NHS staff receive around £38.5 million from the pharmaceutical industry annually, and Dr Gordon estimates up to £4m of this may go to workers in Scotland, with no way to judge whether it has an impact on activities such as prescribing decisions. Dr Gordon said: “Only a tiny proportion of the £4m known to be paid to healthcare workers by the pharmaceutical industry has been recorded in NHS Scotland registers. After a series of hearings, Holyrood’s petitions committee agreed to commission a public consultation about whether changes were needed to improve transparency for patients and the public. But Dr Gordon says the consultation, being carried out by the Scottish Health Council (SHC), is not giving people the full facts and could render the process invalid or even look like manipulation. A briefing being used for the meetings implies that existing rules on transparency may be sufficient and are currently working. Dr Gordon says that is not the case, and key details have been excluded. “The petition would not have been raised, nor indeed considered by the committee, had it not been for… evidence which has not been provided to the discussion groups,” he said. He said no NHS Scotland board has fully complied with official government guidance issued in 2003 requiring chief executives to set up registers of interests for all employees including GPs. Continuing medical education is in some boards entirely supported by sponsors such as the pharmaceutical industry, Dr Gordon said, and patients have no way of knowing if a doctor prescribing drugs has been paid by a drug company or been trained by people who have received such payments. The briefing was prepared for the SHC by the Scottish Government. It says figures from the Association of the British Pharmaceutical Industry show healthcare professionals receive payments for a range of activities including training, clinical trials, media work and market research. An ABPI register of payments is expected to be implemented this year. 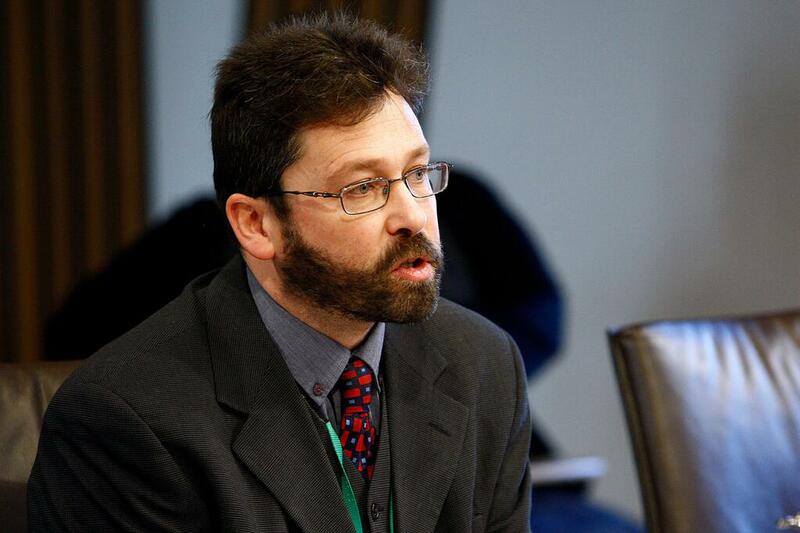 A spokesman for the Scottish Health Council said: “One of the key functions of the Scottish Health Council is to ensure that members of the public have the opportunity to give their views on key healthcare issues. 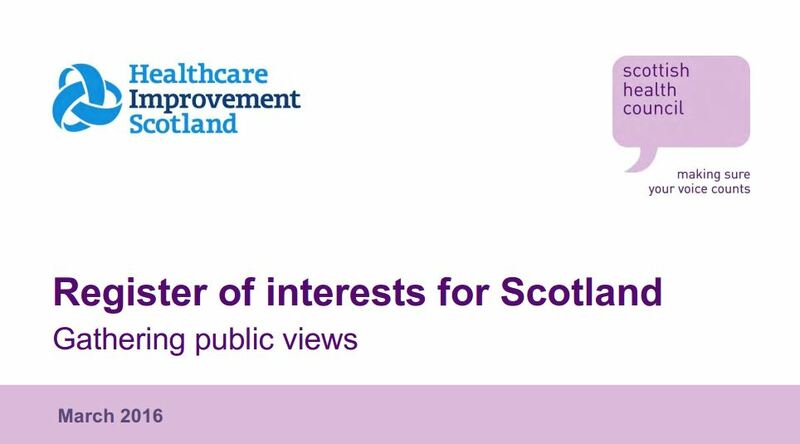 “Following a request from Scottish Government, the Scottish Health Council organised and facilitated a series of discussion groups to gather views from the public on whether there should be a register of interests for NHSScotland. “Twelve discussion groups have been held around Scotland so far and more are planned to provide further opportunities for people to comment on this issue. People taking part in the discussion groups have been drawn from a range of sources including local community contacts, Public Partnership Forums and voluntary organisations. 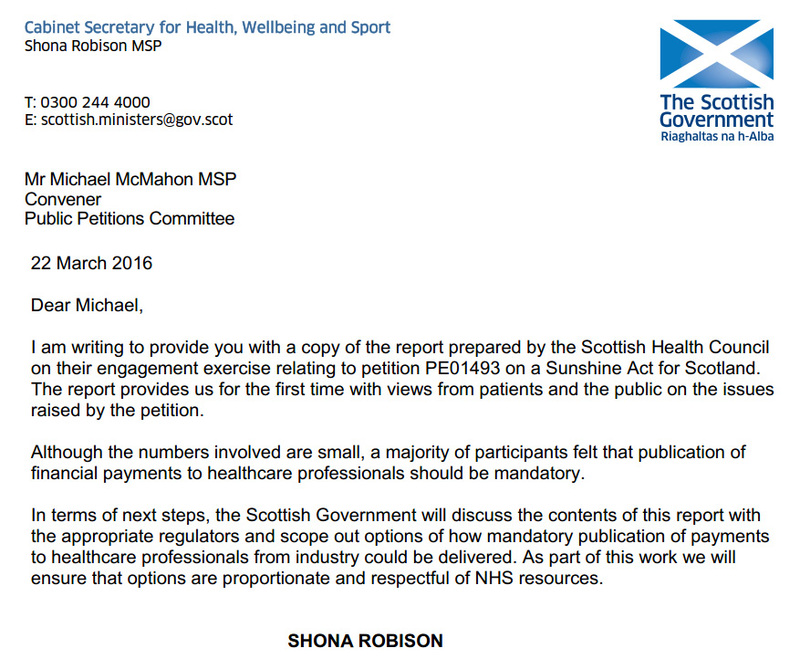 Health Secretary Shona Robison said Dr Gordon had been given the chance to comment on the consultation before it began and added: “We look forward to seeing the outcomes of the Scottish Health Council work. “The Scottish Government commissioned this work to gather views on what a robust, transparent and proportionate response to this issue should look like. He added: “I’m not a whistleblower but I am someone who believes the drugs, medications and treatments doctors use to help patients must be chosen on the basis of scientific evidence, not advertising. An investigation in July revealed health staff in England who help choose drugs for the NHS were paid to work as consultants to pharmaceutical firms. It found some NHS managers were charging up to £15,000 to organise meetings, sometimes in luxury hotels. (Imitrex user in Salon.com article 2015). Marketing the antidepressant Wellbutrin as superior to other antidepressant alternatives due to increased sexual functioning and weight loss, pushing the drug as the “happy, horny, skinny drug,” to concisely encapsulate GSK’s off-label Wellbutrin marketing campaign. If Andrew Witty was Glaxo’s VP-General Manager of Marketing in 1997, then what did he know about the various marketing scams, suppression of side effects etc- which went on in the company at that time? I was prescribed Seroxat in 1998 and information (or misinformation) about side effects was likely contained in some kind of ‘educational’ promotion to doctors back then. How much was Witty aware about Seroxat prescribing to kids? or Seroxat side effects generally? how much input did he have in the promotion of these drugs? And how much was he aware about Imitrex, or off label prescribing of Imitrex in kids? He seemed to be involved in Wellbutrin marketing also, and Wellbutrin was one of the drugs named in the complaint, alongside Imitrex, and Paxil of course. “…We started experimenting with DTC early and made a relationship with the rulemakers,” says Mr. Witty. Indeed, Glaxo has been the top advertiser in DTC prescription drug advertising-a business expected to hit $1 billion this year-for two years running. Last year alone, Glaxo’s nasal spray Flonase received $32.7 million in support, migraine remedy Imitrex got $20.4 million, Serevent asthma inhaler had $16.4 million. We know now that Seroxat/Paxil was extremely dangerous for under-18’s (causing kids to kill themselves, self harm etc). The RIAT study proved that beyond doubt. And what do we know about Imitrex (sumatriptan)? The drug which Witty mentions in the 1997 article above? All off label ..and yes it was a dangerous drug. ..a Vasoconstrictor one that not only worked on cranial blood blow, but also cardiovascular blood flow. Not for kids, and despite years of studies it was never proven safe or effective in kids under 18. In spite of that at least 25% was underage and another 25% off label. More money was spent making hundreds of docs, literally millionaires, speaking to groups about off label use. -The lead investigator, Sarah Bloom, at the end of the 9 year saga, told Greg…that “she was unaware that Imitrex never was proven safe or effective in children”..
As with Imitrex, this was also the case on some 8 other drugs- including Paxil/Seroxat- where they diminished his ability to mine government data, even as the Federal Court gave him permission to do. Furthermore, in spite of a clear order by a Federal Judge, the DOJ did not let Greg data-mine any data including a lot of specifics on Paxil marketing that only he claimed. Greg was the only major whistle-blower who was retaliated against and terminated by GSK and also the only one who reported misconduct to the company first, and did not do it for a possible award. All of the others were terminated and/or planners and initiators of GSK Fraud and corruption, some slipping into the case some 8 years after Thorpe’s initial complaints in 2001. “….Although, I did not directly sell Paxil, I witnessed everything the Paxil reps said and did. I believe with what I knew and looking in the right places, a fine of much greater than 3 billion should have been paid for Paxil alone, and at least the same for Imitrex. GSK sold 3 billion dollars of Paxil the year I filed, 2003..most off label, and denying addictive properties. Obviously the DOJ was in coverup mode. 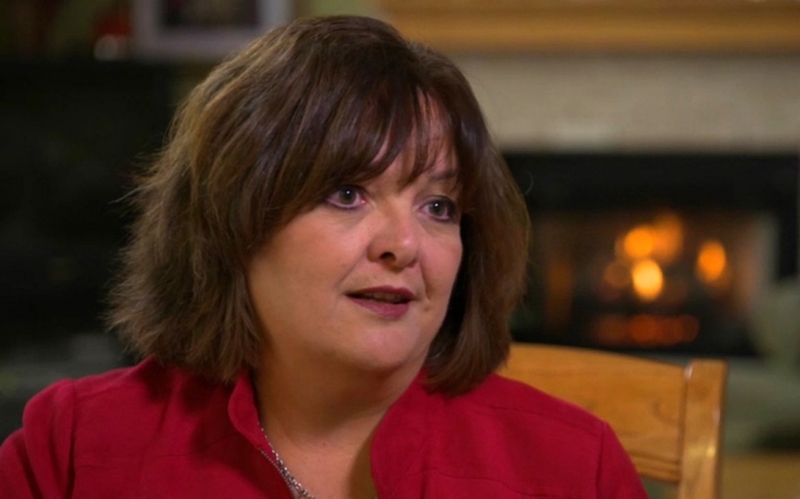 Who was the ringleader, Sarah Bloom ? I highly doubt it. I also highly doubt they will do anything serious in other countries, after seeing what was done here”…. I found an old article online from around 2004/2005 (advertising disguised as objective medical information) which shows the lengths Glaxo were willing to go in order to push this dangerous drug to kids. If you google the article, you’ll see that it was widely disseminated online at that time. COLUMBUS, Ohio – A new study suggests that when over-the-counter medications fail to help children who suffer from chronic migraine headaches, those children may find relief with a drug traditionally prescribed to adults. Around one out of every 10 children experience chronic migraines, said Ann Pakalnis, a study co-author and a clinical associate professor of pediatrics and neurology at Ohio State University and Columbus Children’s Hospital. She and her colleagues treated 57 children with sumatriptan (Imitrex) nasal spray. More than three-quarters of the families in the study reported good to excellent relief of their child’s headaches after using the spray, and nearly 100 percent of the children in these families continued using the drug. But sumatriptan isn’t approved by the U.S. Food and Drug Administration for use in children. The participants in this study were prescribed sumatriptan on an off-label basis, a common practice in which a medication is used to treat a group of people or a problem it wasn’t originally intended to treat. The findings appear in a recent issue of the Journal of Child Neurology. Pakalnis conducted the study with Donna Kring, a nurse at Columbus Children’s Hospital, and Juliann Paolicchi, a pediatrician at the hospital. The researchers took a retrospective approach to appraising sumatriptan’s effectiveness in children. They reviewed the medical charts of children 5 to 12 years old who were patients at Columbus Children’s Hospital, tallying the number of children prescribed the nasal spray. Each child’s family then received a questionnaire asking about the child’s use of the spray, its effectiveness and any concerns regarding the off-label use of the drug. The majority (77 percent) of the 57 families who responded to the questionnaire reported that sumatriptan nasal spray had significantly helped their child, and 93 percent of these families noted that their child still used the drug. Thirteen patients (23 percent) reported side effects from using the spray. Each of these children said the spray tasted bad, and five in this group stopped using it altogether. Sumatriptan nasal spray tastes very bitter and metallic to some children, Pakalnis said. Four of the 13 patients complained of dizziness. Two children found the spray difficult to use, and stopped using it. Migraine triggers such as dehydration, fatigue and hormonal changes cause changes in nerve impulses that in turn affect blood vessel diameter and biochemical release. Blood vessel dilation causes pain, which analgesics can help alleviate. But analgesics don’t address the symptoms that often accompany migraines, such as nausea, vomiting and sensitivity to light and sound, which are usually caused by blood vessel constriction. Sumatriptan and related drugs stop pain by restoring the nervous system’s ability to block pain impulses and help constrict blood vessels. And the triptans also help dilate the constricted vessels that contribute to they symptoms that accompany migraine attacks. About 30 percent of the patients coming to Pakalnis’ office seek help for migraines. She and her colleagues currently prescribe sumatriptan nasal spray to about three-quarters of these patients. “It’s an effective and safe treatment for children who don’t respond to over-the-counter pain killers,” she said. The study was supported in part by Glaxo Smith Kline, makers of sumatriptan nasal spray. So if Glaxo were misleading their drug reps to sell drugs like Imitrex to under-18’s, and obviously the marketing department were creating content for product placement disguised as objective information (such as the article above) then who (or whom) was directing this behavior from the top? You’d have to wonder, would Andrew Witty have allowed any of his kids to take drugs like Imitrex, or Seroxat, or Avandia, or Pandemrix? Because he would have known their full side effect profiles perhaps wouldn’t he?.. If you look at the latest prescribing information leaflet (PIL) for Imitrex you will notice that it’s just as frightening as Seroxat..
How many kids and adults were misinformed and harmed? See document (directly) below (from Greg Thorpe’s complaint) for an example of how GSK pushed Imitrex off-label. For more information, go to http://www.gsk.com or call 1-888-825-5249. Dr. David Wilson can pursue a medical malpractice lawsuit against the hospital where his daughter, Dr. Sandra Wilson, was on staff and received treatment prior to her death in 2006, reports the Yakima Herald-Republic. Individuals in need of financial assistance to pursue medical malpractice lawsuits can often secure legal loans. The lawsuit alleges doctors at Sunnyside Community Hospital improperly administered a migraine medication, Imitrex, to 35-year-old Sandra Wilson, who sought treatment for symptoms including nausea and speech problems, the Herald-Republic reports. The news source says Wilson began having seizures after being on the medication for three days. She died after being transferred to a Spokane hospital, where it was discovered the Imitrex had exacerbated a preexisting constriction of one of her major brain arteries. According to the Herald-Republic, a previous ruling in the case found David Wilson could not sue Sunnyside in part because his daughter had been a contracted physician there. An appeals court recently reversed this dismissal, meaning the case will go to trial if a settlement is not reached. Before the tablet version of Imitrex went on the market in 1995, Mother Jones reported on Dianne Riley, a 41-year-old mother of four who died from a heart attack that seemed to be the result of an adverse reaction to the drug. Over the past five years, GSK has made fundamental changes to its business model including re-investing 20 per cent of all profits in the least developed countries to help communities strengthen their local health infrastructure. Over the last few months I have been in correspondence with a whistle-blower from Yemen who claims that GSK have been involved in various unethical shenanigans there (see here). I have in my possession some pretty damning information however I cannot publish yet, but I will hopefully be able to- by the end of the month (so stay tuned). Allegations of corruption by GSK are nothing new- back in 2012 they paid the biggest healthcare settlement fine in US history (a staggering 3 Billion dollars) and as recently as 2014 they paid half a million dollars to settle a big corruption case in China. So what’s the big deal if GSK are behaving badly, or unethically, in Yemen -or other countries? Well, in a developing country like Yemen, perhaps it’s fair to say that GSK can get away with a little more than they would in say- the US or UK? Personally, I think that the GSK culture is riddled with corruption, and despite claims by GSK Andrew Witty that this kind of behavior is from another ‘era’ and not current GSK policy, the corruption in GSK doesn’t seem to be stamped out, and it’s arguable that it is more widespread globally..
GSK have built their business model on corruption, it’s how they have generated their vast profits. Without lying and deceiving they wouldn’t have had a blockbuster like Seroxat/Paxil for example. If they had told the truth about that drug- they wouldn’t have made billions on it. You could say the same for Avandia- another controversial GSK drug- or even how they marketed Advair (their asthma drug at the center of the GSK department of Justice investigation- see Greg Thorpe’s complaint here). They have infiltrated, and leveraged influence- on- governments, academia, universities, NGO’s, healthcare policy, regulation etc. Corruption and bribery (both legal and illegal) is rampant wherever GSK goes because that’s a successful business model that evidently works for them. If the Yemen whistle-blowers allegations are true then it seems that Save the Children should be concerned also about off label prescribing of GSK owned drugs in Yemen to- (you guessed it)- children..
‘We would never refrain from speaking out on an issue because we had a partnership with a particular company. That would clearly compromise our values,’ claims Save the Children. Many thanks for getting in touch with Save the Children about our partnership with GlaxoSmithKline. I believe you have contacted us before on this, and we thank you for your interest. Save the Children is aware of the reports on the historical issue of Paxil. As an organisation we take our reputation and our role to protect children very seriously and assess all our partnerships within this context. We acknowledge there are risks associated in working with a pharmaceutical company such as GSK, but our belief is that these risks are outweighed by the benefits of the partnership in helping us achieve our ambitions for children. As part of our partnership we continue to have open dialogue with GSK and monitor their business practices, in order that we respond appropriately should future issues arise. Private sector partnerships are instrumental in enabling Save the Children to realise our vision and our partnership with GSK will have a lasting impact on global mortality rates. The focus of the partnership is to help to save a million children’s lives in the developing world and it combines GSK’s relevant skills, expertise and resources across its business with the funding of healthcare programmes for the poorest children in developing worlds. Ever wondered why you feel brain damaged after taking Seroxat/Paxil? Or why you felt brain fog on it? Or maybe you have memory loss and just never felt the same since? (Reuters Health) – Commonly used drugs for problems like colds, allergies, depression, high blood pressure and heart disease have long been linked to cognitive impairment and dementia. Now researchers have some fresh evidence that may help explain the connection. SOURCE: bit.ly/1WcH6Dt JAMA Neurology, online April 18, 2016. Eighteen smokers have died after taking Zyban – the new ‘wonder cure’ for nicotine addiction, The Mail on Sunday reveals today. The deaths, reported by GPs to the Department of Health, have occurred in the seven-and-a-half months since the drug was launched. Those who died were mainly in their 40s and 50s – although one was aged just 21. Health Department figures also show that 3,457 Zyban users have suffered a disturbing range of suspected side effects – from chest pains to fits, seizures and depression. Manufacturers GlaxoSmithKline and health officials last night insisted there was no evidence that Zyban was unsafe. But Ministers are under pressure to launch an urgent investigation into the drug, which has been prescribed to some 270,000 smokers in Britain. You could be forgiven if you were duped by some of the headlines the last few days about a new study which apparently exonerates GSK’s Zyban and Pfizer’s Champix/Chantix (both marketed as stop-smoking drugs) of any serious neuro-psychiatric side effects. GSK’s Zyban (and Pfizer’s Champix) have long been linked to suicide, and other neuro-toxic effects. Zyban is just GSK’s ‘anti-depressant’ Wellbutrin (Bupropion) marketed under another name for the stop-smoking market. GSK’s CEO Andrew Witty was once involved in Wellbutrin marketing, and you’d have to wonder what he knows about these neurotoxic side effects? (see here). On face value this article about the study looks above board doesn’t it? That’s until you see who’s really behind it. “...The EAGLES study – published in The Lancet – backed the safety and efficacy of Pfizer’s Chantix/Champix (varenicline) and GlaxoSmithKline’s Zyban (bupropion) as well as nicotine replacement therapies in helping people quit smoking. Questions about the safety of Champix and Zyban first came to the fore in 2009, when the FDA ordered Pfizer and GSK to include box warnings on their products to warn of their possible link to “changes in behaviour, depressed mood, hostility and suicidal thoughts”. However, what the article does not state are the competing interests of one of the lead authors of this study- Mr Robert West of UCL (University of London). Mr West does not state exactly how much he is paid for the research and consultancy for work he does for companies like GSK, Pfizer and J and J, but you can be sure that he doesn’t work for peanuts- he is a Professor after all and I’m sure he would expect a nice fee after all those academic years of attainment. Furthermore, considering Professor West’s admitted conflict of interests with the companies that make the drugs which his research is based upon- does this mean that we should take his study into Pfizer’s Champix and GSK’s Zyban with a generous pinch of salt? I think that would be wise, don’t you? It seems someone has already requested (under a FOI mechanism) to see what links Mr West has to Pharmaceutical companies already (see here). Please provide all correspondence over the past 5 years between DH and Robert West, Editor-in-Chief of Addiction Journal, Professor of Health Psychology and Director of Tobacco Studies at the Cancer Research UK Health Behaviour Research Centre, University College London, co-director of the National Centre for Smoking Cessation, co-author of the English National Smoking Cessation Guidelines and consultant to numerous pharmaceutical conglomerates that develop and manufacture smoking cessation medications including GSK, J&J and Pfizer. Given that Prof Robert West is a paid consultant for the pharmaceutical lobby, please advise how his conflicts of interest are handled, and how the DH ensures that his evaluation of pharmacological and behavioural aids to smoking cessation and his training programmes for medical staff are free of conflicts of interest. Mr West is not the only author of this study with links to Pharma, if you click on the names of each author on the Lancet page where the study is published (here) you will see that many of the other authors also have various links to pharmaceutical companies. Lisa St. Aubin – Pfizer. Alok Krishen- Paraxel internatinal on behalf of GSK. It looks to me that this Lancet study is little more than a product placement for Pfizer and GSK and also a PR move in defense of Champix and Zyban. The articles below illustrate the long documented problems with drugs like Zyban..
And its information from links like this (from real people’s online experiences of Zyban and Champix) which Pfizer, GSK- and perhaps even Dr West and his associates- would likely (conveniently) dismiss as merely ‘anecdotal‘. VANCOUVER – Use of a popular smoking cessation and depression medication led to 64 hospitalizations — including 22 cases admitted to critical care — last year in B.C., according to the province’s Drug and Poison Information Centre. The centre handled 95 calls last year about bupropion overdoses, including 22 cases where the wrong dosage was taken, 47 cases of suspected suicide attempts and nine cases of misuse or abuse. There was one death. Burpropion is marketed under the brand names Wellbutrin and Zyban. Since not all cases of overdoses or abuse are reported to the centre, it is likely there are far more cases in B.C., said Dr. Roy Purssell, an emergency room physician who is also medical head of the drug and poison centre, an agency affiliated with the Provincial Health Services Authority. “We’re on edge about this medication and we want doctors and the public to be aware of our concerns. It has the propensity to cause serious, toxic effects. And I don’t think there is awareness about how big the risks are,” Purssell said in an interview. 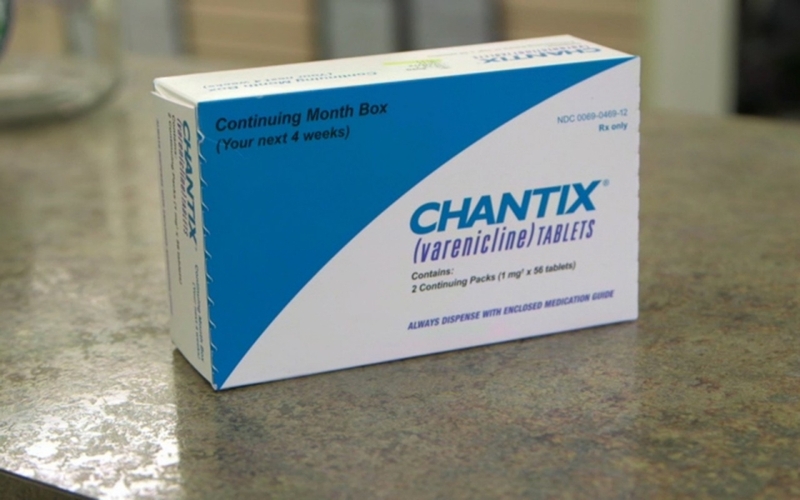 After being approved by the FDA in 2006, Chantix was given a black-box warning by the FDA for the serious adverse effects caused by the drug. Tina Hurst was living what she considered a perfect life in her quiet neighborhood in suburban Chicago. She was happily married, the mother of two teenage girls and an executive at an insurance company. Hurst also had a secret. She was a closet smoker, an on-again, off-again, pack-a-day habit she’d hidden from her family. “I would quit for a couple of months and then I would start back again, so it was one of those periods where my family thought I was still not smoking, and I had started again,” Hurst said. Hurst called her doctor, who suggested a prescription drug called Chantix, which is designed to help smokers quit by curbing the desire to light up. Hurst thought she’d found an easy fix. Wiithin a week, she quit smoking. “I thought it was a miracle drug, you know?” she said. As Hurst continued taking the drug as prescribed, her well-ordered life started coming unhinged and she began acting erratically. After her husband convinced her to throw the pills away, Hurst said she went over the edge. “It was just like, boom! Something went wrong,” she said. Hurst, who said she’d never been depressed or suffered from any other mental illness, started experiencing hallucinations and suicidal thoughts. Hurst threatened to jump out of a moving car, forcing her parents called 911. Hurst wound up spending five days in a locked-down psychiatric ward at a local hospital, a nightmarish experience she blames on Chantix. Chantix, approved by the U.S. Food and Drug Administration in 2006, has a long history of users – and their next of kin — reporting troubling, sometimes deadly, side effects they blame on the drug. In the last five years, 544 suicides and 1,869 attempted suicides have been reported to the FDA as “adverse events” in connection with Chantix, according to documents obtained by America Tonight under the Freedom of Information Act. Adverse events are side effects reported to the FDA by patients, doctors or health professionals, or the drug makers themselves. The reports don’t prove cause and effect but serve as an early warning system of sorts for the FDA, which monitors federal drug safety. In 2008, Thomas J. Moore, senior researcher with the Institute for Safe Medication Practices, was testing new software to analyze adverse events when he made a startling discovery. “Here, basically going off the charts, was this new smoking-cessation drug called Chantix,” Moore said. Moore found that Chantix was responsible for more adverse events – including the type of serious psychiatric episodes such as Hurst’s – than any other drug on the market. They fell into four categories: suicidal behaviors, depression, psychosis and aggression. “There were side effects that made it look like it was unsafe for pilots and people in critical occupations because there were seizures, blackouts, temporary blindness, blurry vision,” he said. The Federal Aviation Administration and Defense Department took heed and banned Chantix use among pilots and air traffic controllers. The military also banned Chantix for missile crews. Clinical trials of Chantix have failed to turn up suicidal behavior or the type of aggression and violence reported to the FDA as adverse events. “Pfizer believes in and supports Chantix as an important treatment option for adult smokers who want to quit and takes the safety of all of its medicines seriously,” Pfizer said in a statement to America Tonight, adding that the drug has been prescribed to more than 20 million people worldwide. Smoking remains the largest cause of preventable death and disease in the United States, and the FDA is standing behind Chantix, which has a 12-month quit rate of 22 percent, slightly better than counseling or nicotine-replacement therapy such as the patch or gum. Dr. Michael Siegel, a professor at Boston University’s School of Public Health who has studied smoking for 25 years, said it’s unrealistic to ask doctors to monitor for attempted suicide. Tina Hurst thought Chantix was a “miracle drug.” Now, she’s still paying the price. For that reason, Siegel has called for Chantix, which made $670 million in sales last year, should be pulled from the market. Moore doesn’t go that far. He said more restrictions should be placed on Chantix. “People who carry weapons for a living such as police officers and military should not take a drug, which can cause – and this is well-documented – uncontrollable rage,” he said. The FDA has asked Pfizer to investigate reports of violence by Chantix users and report back by 2017. Earlier this year, Pfizer spent close to $300 million to settle 2,700 Chantix lawsuits, and the judge in the case says the black box warning is sufficient, meaning future litigation is unlikely. Tthe company has stepped up advertising the drug, offering testimonials from happy customers able to quit a pernicious habit. But for Chantix users like Hurst, life took an unexpected detour, even as Pfizer continues to make hundreds of millions of dollars on the drug. Is GSK’s Migraine Drug – Imitrex- Dangerous And Deadly? I took GSK’s Seroxat (Paxil) Drug for over 3 years in my twenties and I’m lucky that I lived to tell the tale. The side effects from Seroxat are horrendous, and GSK suppressed them from public view for years. It took 4 BBC documentaries and much public outcry before GSK would admit to any problems at all with Seroxat. GSK still sell it, they still profit off it, even though it has harmed so many people. GSK’s Avandia drug was also embroiled in controversy a few years ago with links to thousands of heart attacks, and their Pandemrix drug has been linked to Narcolepsy for quite some time. Their Myodil dye product has crippled, maimed and harmed patients for years too, with many still just coming out of the woodwork. In recent posts on this blog about Myodil, I regularly receive comments from people who were injected with the Dye decades ago, and they are still crippled from it. Many of these people will have no hope of justice for their pain and suffering, because GSK are often too powerful to tackle, particularly if one individual tries on their own. These are essentially forgotten victims of GSK’s fraudulent behavior. From taking Seroxat, I know that GSK are capable of releasing extremely dangerous drugs and chemicals on to the market. I wouldn’t trust any of their drugs or products as safe or effective. However GSK have dozens of products on the market which are potentially harming people. One of the drugs listed in GSK whistle-blower Greg Thorpe’s 2012 Department of Justice complaint was GSK’s migraine drug- Imitrex. Imitrex, a popular new drug for treating migraines, has been associated with hundreds of life-threatening problems and deaths. So why do the FDA and Glaxo, the drug’s manufacturer, both claim that it’s safe? The Food and Drug Administration, sometimes criticized in past years for being too cozy with corporations, has lately come under attack for exactly the opposite failing. A powerful bloc of critics in industry and the Republican Congress is pushing to overhaul the FDA, claiming the agency is too tough on drug companies, unnecessarily inhibiting innovation and delaying the approval of new drugs and medical devices. Leading the charge is Speaker of the House Newt Gingrich, who has labeled the FDA the “number one job-killer” in the country, and called its head, David Kessler, “a bully and a thug.” Gingrich’s Progress & Freedom Foundation has announced a radical plan to privatize much of the FDA’s oversight of drugs and medical devices. Not surprisingly, the foundation has financial backing from some of the biggest names in the pharmaceutical industry, including Bristol-Myers Squibb Co., Eli Lilly & Co., and Marion Merrell Dow. Glaxo, manufacturer of Imitrex (see main story), has also given an undisclosed amount to the foundation, in addition to contributions of approximately $325,000 to the Republican Party and Republican candidates (including $4,000 to Gingrich) in the last election alone. As a whole, the drug industry contributed more than $1.6 million to the Republican Party in the 1993-94 election cycle. If enacted, the Progress & Freedom Foundation’s plan will place responsibility for drug development, testing, and review in the hands of private firms hired by the drug companies themselves, while retaining a weakened FDA to rubber-stamp their recommendations. Additionally, the plan limits the liability of drug companies that place dangerous drugs on the market. An interim report on the foundation’s study was released in June; the final version is due out later this fall. The Progress & Freedom Foundation plan also limits the liability of drug companies should a patient be injured or killed by a dangerous drug or medical device. According to the proposal, a victim could not sue for punitive damages if the manufacturer of the product could show that it had met regulatory standards–however weakened–during development and testing. Even some in the drug industry believe the Progress & Freedom Foundation’s proposal goes too far. Steve Berchem of the Pharmaceutical Research and Manufacturers of America says that while some drug reviews can be handled by the private sector, it would be a mistake to weaken the FDA’s authority over product approvals. “We need an FDA that maintains public confidence,” Berchem says. As the battle to reshape the FDA heats up in the coming months, the Progress & Freedom Foundation will coordinate its efforts with those of other heavily funded right-wing attacks. But look for Newt and Company to draw their proposals directly from the foundation’s plan. Despite the medical risks posed by Imitrex injection, you are not required to take the medication in the presence of your doctor. Imitrex can be administered at home, at your workplace, or at any other location by using an “autoinjector,” a futuristic-looking plastic injector that contains a prefilled syringe of Imitrex and requires only the push of a button to release the medicine into the bloodstream. On the morning of Feb. 4, 1994, Dianne Riley joked nervously with her husband and one of her four children about a dream she’d had the night before in which someone had died. This wasn’t a pleasant way to begin the day, because once before Riley had actually forecast a death in this manner. To make matters worse, Riley had a miserable headache. For five days running, the 41-year-old assistant manager for a Ramada Inn in Kansas City, Mo., had felt the pain in her head build to the point where she would be overpowered by nausea. Later that morning, Riley had an appointment with Dr. Samuel Ho, a specialist in internal medicine. He diagnosed migraine, a slowly developing headache with throbbing pain that is usually felt on only one side of the head. The condition is believed to affect between 15 and 25 million Americans, mostly women. Ho recommended Riley try Imitrex, the brand name for sumatriptan succinate, a heavily marketed new drug for migraines. At 12:25 p.m., Riley was given a six-milligram injection of the drug. Within minutes, she began to sweat, vomit, and experience chest pains. Technicians managed to hook her up to an electrocardiograph and quickly discovered that she had an abnormal heart rhythm. They called 911. On April 15, two months after Dianne Riley’s death, her family filed a lawsuit in the Circuit Court of Jackson County, Mo., charging that Glaxo, the British-based manufacturer of Imitrex, had been aware that the drug could cause serious harm or even death. The lawsuit accuses the multinational and its Cerenex division in North Carolina of not adequately labeling Imitrex and not disclosing the drug’s true risks, “in order to collect substantially higher profits.” Glaxo will not comment on the lawsuit because it is under litigation. The case, still in the legal discovery phase, is expected to go to trial sometime in 1996. Dr. Vincent Di Maio, one of the country’s leading forensic pathologists and editor of the American Journal of Forensic Medicine and Pathology, intends to testify on the Rileys’ behalf. He says he has examined all the microscopic slides of tissues and organs from the Riley autopsy and has no doubt that its conclusion was correct. Although Dianne Riley had some risk factors for heart disease (e.g., smoking, family history of heart disease), Di Maio says her heart and coronary arteries were healthy; the heart attack that killed her was precipitated by Imitrex. Imitrex, a top-line Glaxo drug, is used by more than two million people worldwide. The drug’s sales in fiscal year 1993-94 were $365 million. Both of those numbers are likely to increase when the tablet version of the drug becomes available on the U.S. prescription market this month. To date, the Food and Drug Administration has received 3,526 voluntary reports of possible side effects, ranging from mild to severe, associated with the use of Imitrex. Included are reports of 83 deaths and at least 273 life-threatening complications. Earlier this year, Glaxo became the world’s largest pharmaceutical company when it bought Wellcome, another British multinational. Glaxo and Wellcome sold a combined $11.6 billion worth of products last year, to fight everything from asthma and ulcers to heart disorders, infections, and migraines. In the high-stakes pursuit of competitive advantage, drug giants like Glaxo must sometimes spend hundreds of millions of dollars to develop new drugs. To see returns on these investments, companies push hard to get the drugs through the regulatory approval process and promote them vigorously when they are first released. Glaxo’s push of Imitrex was no exception. The history of Imitrex goes all the way back to 1972, when Glaxo launched a research program to develop a new migraine drug. The company’s goal was to find a chemical that could narrow swollen blood vessels in the head, thereby stopping the pain of migraine headaches. But it was also important that the drug not narrow or squeeze blood vessels in the heart, because this could cause spasm in those vessels and trigger a heart attack. More than a decade passed before Glaxo scientists came up with Imitrex. The drug mimicked serotonin, a chemical produced naturally in the body. Serotonin contracts blood vessels by acting on their cells via the gateways or “receptors” known as 5HT. Glaxo researchers thought that Imitrex would affect only the type of 5HT receptor known as 5HT-1, which they believed was rarely found in heart vessels, and therefore the drug would not cause heart spasm. Glaxo believed it had a blockbuster drug in the making, one with a potential market of hundreds of millions of dollars. Looking back, however, some fundamental research data contradicted the presumption that 5HT-1 receptors were generally absent from heart vessels. In one small laboratory study, Glaxo researchers found that Imitrex caused small contractions in coronary artery samples from explanted human hearts, indicating the presence of 5HT-1 receptors in heart vessels. An independent study also supported this hypothesis by demonstrating that Imitrex could cause temporary narrowing in the coronary arteries of patients with or without signs of heart disease. Glaxo, however, emphasized other research that supported Imitrex’s safety. Specifically, one Glaxo study showed that Imitrex did not affect the cardiovascular systems of dogs, indicating that 5HT-1 receptors were not present in the dogs’ heart vessels and suggesting that this might be true for human beings as well. The company also assured regulatory agencies that the drug was safe because its heart-monitoring tests during clinical trials showed that very few patients suffered heart disturbances. Strong indications that these assurances were hollow first surfaced in Canada. On Dec. 20, 1991, Dr. Michele Brill-Edwards, then the assistant director of the Bureau of Human Prescription Drugs at Health and Welfare Canada, wrote a memo to the bureau’s assistant director of operations, Peter Jeffs, expressing her suspicion that Glaxo was pressuring one of her reviewers to move faster on getting approval for Imitrex. After Brill-Edwards reviewed the file herself, she believed that there were potential problems with Imitrex. She was particularly concerned that Glaxo had only thin documentation to show that Imitrex was not a danger to heart vessels. [T]he product monograph remains less than adequate in its characterization of safe usage of this valuable new product. My recommendation is that the clinical division should be required to remedy the deficiencies in the product monograph.–This action should be undertaken notwithstanding substantial pressure to the contrary from the manufacturer. The deficiencies in the monograph were not remedied. On Jan. 16, 1992, nine days after Brill-Edwards wrote her memo, Glaxo announced that it would construct a $70 million manufacturing facility in Canada, promising more jobs and research spending. Four days later, on Jan. 20, senior managers at Health and Welfare Canada approved Imitrex. The next month, when Glaxo launched its promotional campaign for Imitrex in Canada, it claimed the drug “works only on the painfully swollen blood vessels in the head.” The labeling for Imitrex, however, recommended that people with serious heart problems shouldn’t be prescribed the drug, indicating that Glaxo was, in fact, aware of its potential effect on heart vessels. But when reports began to file in at Health and Welfare about side effects following an injection of Imitrex, Glaxo officials took the public position that these reactions were rare and unexplainable. As of July 1992, Health and Welfare had received only 20 voluntary reports of adverse side effects associated with the use of Imitrex, including severe chest pain and breathing difficulties. But by November, an additional 70 reports had been filed, again including chest symptoms. That month, Health and Welfare and Glaxo quietly cooperated in rewording the product labeling. The new labeling advised doctors to take a careful medical history to avoid prescribing Imitrex to anyone with heart disease. Meanwhile, in Britain (where Imitrex had been available since 1991), a new chapter in the drug’s story had begun. A case report was published in May of 1992 in the British Medical Journal concerning a 47-year-old man with no sign of heart disease who developed severe chest pain after injections of Imitrex. Further tests with the patient showed that within six minutes of receiving a shot, his heart vessels began constricting. A month after this case was reported, the U.K. Committee on Safety of Medicines, Britain’s drug regulatory group, reported that Imitrex could cause heart vessels to constrict. Glaxo, however, continued to maintain that severe side effects were rare, and that those patients who suffered heart-related complications must have had some underlying heart problem. The FDA approved Imitrex for sale the next day. As part of its Imitrex information package to the press, the FDA stated that “people with underlying heart disease should not take the drug because of its potential to cause constriction of coronary arteries.” As a precautionary measure, the agency also recommended that doctors consider giving the first injection in their office to patients who might have underlying coronary heart disease. But the drug’s labeling included no recommendation to doctors to exclude patients whom they only suspected could be at risk for underlying heart disease. And there was no recommendation for how to treat patients who seemed to be suffering a negative reaction. Imitrex’s reputation as a breakthrough migraine treatment was largely made in the initial burst of promotion upon its release. It wasn’t until August 1994a20 months after the drug’s approval–that the FDA and Glaxo cooperated in making the first significant labeling change for Imitrex. By this time, the number of reported deaths possibly related to Imitrex had grown to at least 33. A new section was added to the Imitrex label. Titled “Drug-Associated Fatalities,” it discloses that some of the reported deaths had occurred within a few hours of Imitrex’s use and that the drug’s “specific contribution–to most of these deaths cannot be determined.” The death of Dianne Riley is noted, though not by name, among them. (The notation, however, does not mention that Riley’s autopsy showed her to be free of heart disease. Instead, it lists her risk factors for heart disease–“positive family history, postmenopausal woman, and smoking”–implying that she might have had heart disease.) The FDA also asked Glaxo to send out what is known as a “Dear Doctor” letter, to inform physicians of the labeling change. Three months later, there was a second major relabeling and another Dear Doctor letter. Glaxo now emphasized that Imitrex should only be used when a doctor had clearly established that a patient was suffering from migraine. The drug was not intended for any other kind of headache. The new labeling also recommended that Imitrex “not be given to patients in whom unrecognized coronary artery disease is likely without a prior evaluation for underlying cardiovascular disease.” These patients include postmenopausal women, males over 40, and those with risk factors for heart disease, such as high blood pressure, high blood cholesterol, obesity, diabetes, smoking, or strong family history of heart disease. Of course, even a patient who does not fit these categories might have undiagnosed heart disease and thus could be at risk for serious Imitrex-related complications. According to Dr. Robert Vogel, head of the division of cardiology at the University of Maryland Hospital, the problem is compounded by the fact that there is no such thing as “insignificant” coronary disease. “So-called insignificant coronary disease can be lethal,” he says. The most disturbing possibility is that Imitrex may also affect healthy hearts. Glaxo has consistently maintained that in cases like the one described in the British Medical Journal, some early coronary disease must have been present, even if it was never detected. But what does it mean to claim that someone had incipient (Continued on page 70) (Continued from page 31) heart disease if, as in Riley’s case, the patient was outwardly healthy and the disease could not be detected, even by an autopsy? And if the disease is undetectable, how can doctors rule out patients for Imitrex use? Concerns that Imitrex might trigger heart attacks are not Glaxo’s only problem. Recent research suggests that coronary spasm, such as that apparently caused by Imitrex, can gradually damage heart vessels over the long term. There is also concern that the drug may induce strokes in some patients. To date, the FDA has also received reports of at least 31 strokes (damage to the brain due to interruption of the blood supply) and an additional 53 cases associated with stroke or with conditions that can lead up to stroke. A lawsuit in Travis County, Texas, is currently in the discovery phase and scheduled for trial this October. On Sept. 1, 1993, shortly after injecting herself with Imitrex, Donna Sue Currie, a dental assistant, suffered a stroke that left her disabled. Her lawyer, Jay Winckler, says the discovery process has revealed other cases of Imitrex-associated stroke known to Glaxo, but he won’t say how many because the case is in litigation. The FDA’s effort to balance Imitrex’s benefits and risks has two major flaws. First, there is insufficient data to show that Imitrex is more effective than other treatments. More importantly, the FDA, along with Glaxo, has failed to provide potential patients with enough information to make an informed choice about a drug that may pose serious health risks. But that is neither the way Glaxo marketed Imitrex, nor the way the FDA and other regulatory agencies have recommended it. Had Dianne Riley known the risks, she might have decided against taking Imitrex. Had she first been prescribed another migraine treatment, it might have done the job. Had the labeling recommended that her doctor have nitroglycerin on hand in case of heart attack, Dianne Riley might still be alive. Such a failure on the part of the FDA does not bode well at a time when the agency is under attack for being too tough on drug companies (see sidebar, page 28). If the anti-regulatory assaults of drug industry lobbyists and congressional Republicans result in further downgrading of the FDA’s ability to ensure drug safety, more patients like Dianne Riley may die. Nicholas Regush is an investigative reporter and television producer living in Montreal. Singer/songwriter and generally all-round thoroughly nice chap, Kirk Brandon, has kindly responded to a Q&A I sent him. Kirk is currently on tour around the UK with his band, Spear of Destiny, so a big thank you for taking time out and answering the questions I put to him. Kirk’s experience of Seroxat mirrors that of many others and it’s unusual for someone in the music business who actually has the gumption to come out and speak about it all. Speaking out about any product manufactured by pharmaceutical companies brings threats of lawsuits, particularly when that person happens to be in the public eye. Kirk’s attitude is, seemingly, a middle finger salute to the likes of GSK ~ Something that has to be applauded. I, like Kirk, experienced horrific withdrawal at the hands of Seroxat ~ I decided to write a blog (and later a book). Kirk wrote a song about Seroxat (video at foot of his Q&A’s) ~ it’s a song that resonates and one can hear the passion through the lyrics and delivery. Kirk and I met a few years ago. He was playing a gig in my hometown and we chewed the cud before he hit the stage ~ I’m sure we will meet again at some point in the near future, hopefully shoot some pool, have a few drinks and chew the cud some more. Who knows, maybe even set the seeds for some sort of awareness gig,? Sometimes an apathetic public need music in their lives to drive home the message. The music industry needs more lions with courage, it needs more Kirk Brandon’s. Q: Kirk, first off, thanks for taking time out for this Q&A with me. I know you’re currently on tour with your band. Can you tell me about your projects of late, ie; Spear of Destiny, Theatre of Hate, your project with Sam Sansbury and also if you plan to record and tour with Dead Men Walking again? A: Currently on tour with Spear of Destiny. A band I have had since 1983. Later this year, November I believe we are releasing a new album of Theatre of Hate music. This album has been over 9 years in the making. Theatre of Hate pre dates Spear by 2 years. We’ll also play a handful of shows at its launch. Apart from this, I have recently taken up a new endevour, a recording and tour of myself on acoustic guitar accompanied by cellist Sam Sansbury. The success of this has actually surprised us all. It has been a very new way of interpreting the music I have written. We will do some more live shows later in the year. A:Seroxat came at my very lowest point in my life. I went to the Dr and asked to speak and talk things through with someone but instead he put me on Seroxat. I took it for 10 months until ultimately going ‘cold turkey’ from it as it is highly addictive. After initially taking it, I quite quickly entered a hallucinogenic world. This was pretty scary a place to find yourself. I saw things that obviously were impossible and experienced thoughts and emotions I had never experienced before. At one point I felt I was possibly becoming insane. The things I felt and saw were things I had never before or since experienced. It was the drug without doubt. On two occasions I contemplated suicide on a very serious level, but realised that I could not do this to my two year old daughter and mar her very young life. Alongside these traumatic thoughts and feelings I was overwhelmed with feelings of rage. I contemplated murdering people and it’s my belief that at the end, when I went through the truly harrowing experience of cold turkey, I was in fact a short time away from actually killing people. Q: Your album, ‘Dutch Masters The Story So Far – II’, featured a track called ‘Seroxat’, the lyrics are very powerful. Can you tell me what prompted you to write this? A: I wrote the song ‘Seroxat’ as way of telling people of the dangers of addiction to the drug and also as a message to GSK. I knew they would view the song as an irrelevance as they would me but, the public need as dire a warning as possible on the subject of Seroxat. People kill themselves on it and kill other people as well. Especially in America where guns are easily accessible. Q: Do you know many people in the music business who are unaware of the side effects that drugs, such as Seroxat, can cause? A. I do meet people, musicians who have have had their brains and lives altered by the drug Seroxat. Generally people tend to find out about it only after having taken it. Q: This question is in two parts Kirk, would you ever consider doing a benefit gig for victims of Seroxat and other antidepressant-type drugs and do you think that by raising awareness through the medium of music is a way forward with regard to holding pharmaceutical companies accountable for unsafe and potentially dangerous drugs they manufacture? A: A concert for the dangers/awareness of Seroxat? Yes, absolutely. The public need an awareness of the frightening consequences of taking this mind bending drug. As for the pharmaceutical giant GSK, again yes. Their sinister policies/practises especially with this drug needs exposure. Q: You have a pretty huge fan base, would you say that the majority of your fans know about your struggles with Seroxat? A: I think they know I went through a very bad experience with the drug, yes. They know I have very strong feelings on the subject. Q: Would you recommend writing a blog or public diary to people who had suffered severed antidepressant withdrawal events? A: Yes. It may help with life after Seroxat addiction and act as a warning to others that even at low points in their lives, to stay well away from this hallucinogenic terrifying drug. Q: Do you have any more songs in the pipeline that have either Seroxat or GlaxoSmithKline as the subject matter? A. At the moment no. Q: Have you ever considered writing a book about your time and subsequent struggle with Seroxat? A. This part of my life is well documented in my memoires I am currently finishing up on. A. If they are safe, explain the suicides and violence done whilst people have taken the drug. If a flag doesn’t come then these people are blindly leading themselves into a hell world, easily accessible but ultimately extremely difficult to escape from. A. Would he give Seroxat to his own children? As his company once recommended to Dr’s via their reps? Does he believe drug induced suicide is viable as company policy? What will he personally do for atonement for the deaths of people on his watch as steward of GSK? Q: Do you think that Seroxat and other SSRis need to be banned or do you feel that they do benefit some people? A. Ban them immediately. Release all data from the companies into the public domain. Q: What is your opinion with regard to the way prescription drugs are regulated in the UK, do you think the British drug regulator, the MHRA, are doing enough to protect patients from harmful drugs? A. The MHRA are not fulfilling their purpose if no action is taken regarding Seroxat and GSK. An investigation should be launched into all policy regarding GSK by them. An independent governmental one. A. I hope still alive. Questions need answers. The public needs information. Accountability.